In this Japanese name, the family name is Hijikata. Hijikata Toshizō (土方 歳三, May 31, 1835 – June 20, 1869) was a Japanese warrior. As Vice-Commander (副長, Fukucho) of the Shinsengumi, he resisted the Meiji Restoration. Hijikata Toshizō Yoshitoyo (土方 歳三 義豊) was born on May 31, 1835, in the Ishida village, Tama region of Musashi Province (present day Ishida, Hino), Japan. He was the youngest of six children (later records discovered in recent years revealed that he was actually the youngest among the ten children), and his father Hijikata Yoshiatsu (Hayato), a well-to-do farmer, died a few months before his birth. His eldest brother Tamejiro, was born blind and as a result, could not inherit the family property. His 3rd older brother Daisaku (later Kasuya Ryojin), was adopted to another family and would later became a physician. His eldest sister Shuu died when he was about three years old and his mother Etsu also died when he was six years old, and he was therefore raised by his 2nd older brother Kiroku and sister-in-law. He was apparently tall compared to the average Japanese men of the period, and it is said that he was very handsome. He was said to be spoiled at an early age and was alleged to be mean to all but his friends and family. This changed when a 21-year-old swordsman from the Aizu clan known for opposing the Reformists was forced to commit seppuku. When Hijikata attended the man's funeral, he apparently cried in public. Hijikata spent his youth selling his family's Ishida sanyaku (medicine for treating injuries such as bruises and broken bones) while practicing his self-taught kenjutsu. His brother-in-law, Satō Hikogorō, who was married to his older sister Nobu, managed a Tennen Rishin-ryū dojo in Hino; through Satō, Hijikata later met Kondō Isami and was formally enrolled at the Tennen Rishin-ryū's Shieikan in 1859. Although Hijikata himself never fully mastered the Tennen Rishin-ryū, it is said that he managed to develop the "Shinsengumi-Kenjutsu" fighting style from the Tennen Rishin-ryū. An arrangement was made by his eldest brother Tamejiro for him to marry Okoto, the daughter of the shamisen shop owners. Since he had already planned to join the Rōshigumi with Kondō Isami, Hijikata told them that after he got a promotion, he would carry out his marriage. In 1863, Hijikata and Kondō Isami joined the Rōshigumi in Edo, they arrived in Mibu, Kyoto and remained there as the Mibu Rōshigumi while the rest returned to Edo. Later, when Mibu Rōshigumi was renamed as the Shinsengumi, Kondō and two other men, Serizawa Kamo and Niimi Nishiki, became joint leaders of the group, and Hijikata served as one of the deputy leaders. Shinsengumi served as a special police force in Kyoto that fought against the Reformists under Matsudaira Katamori, the Daimyō of Aizu. However, Serizawa and Niimi began fighting, drinking, and extorting money from merchants in Kyoto, which started to tarnish the reputation of Shinsengumi and earned the group the derogatory nickname of "Wolves of Mibu" (壬生狼, Miburō). Hijikata found enough proof against Niimi in these matters and ordered him to commit seppuku in October 19. Later in October 30 (or October 28) at night, Hijikata and the selected Shinsengumi members went into the house of Yagi Gennojō and assassinated Serizawa, his mistress Oume, and one of his followers Hirayama Goro, with Hirama Jūsuke been the only survivor fled that night. Kondō became the sole leader of Shinsengumi, with Yamanami Keisuke as his Vice-Commander. Some time after the Zenzaiya incident, Yamanami Keisuke tried to leave Shinsengumi, despite the regulation against deserters. As a result, he committed seppuku with Okita Sōji as his Kaishakunin on March 20 (lunar calendar February 23), 1865; and Hijikata took over as Vice-Commander. Due to his position in the Shinsengumi, which would be dangerous for anyone close to him, Hijikata felt that he had no choice but to cancel his marriage engagement with Okoto. Although he later had many lovers, he never came close to making a commitment to any of them. The Shinsengumi grew to 140 men, which included a number of farmers and merchants whose livelihood would be threatened if the Tokugawa shogunate was overthrown. The regulations set up by Shinsengumi within Kyoto were strict and Hijikata was known to be harsh in enforcing them, hence his nickname: "Demon Vice-Commander" (鬼の副長, Oni no fukucho). Even within the Shinsengumi itself, regulations were strictly enforced by Hijikata. As usual, deserters and traitors were forced to commit seppuku. Hijikata owned, among others, a sword signed "Izumi no Kami Kanesada" (和泉守兼定), made by the 11th and last generation[clarification needed] Aizu Kanesada (1837-1903). Together with the rest of the Shinsengumi, Hijikata became a hatamoto in 1867 and took the name of Naitō Hayato (but reverted to his original name after Kondō was captured and executed during the Boshin war). He was given the rank of Yoriai (寄合格 Yoriai-kaku) in early 1868. Following the Boshin War in 1868, Kondō and Hijikata led the Shinsengumi in their final battles against the new government and fought in the Battle of Toba–Fushimi in January 1868. The Shinsengumi returned to Edo and was later reformed into a unit known as the Kōyō Chinbutai (甲陽鎮撫隊, "Pacification Corps") and departed from Edo for Kōfu Castle in March 24 upon orders to suppress the uprisings there. But while on the way there, they received news in March 28 that the Kōfu Castle was taken by Imperial Court forces led by Itagaki Taisuke and later settled at a town of Katsunuma five miles east of Kōfu. In March 29, 1868, Kondō, Hijikata and the Kōyō Chinbutai resisted an attack by the Imperial forces at the Battle of Kōshū-Katsunuma for about two hours but lost, and they were scattered and fled to Edo. In April 11, 1868, Kondō, Hijikata and the Kōyō Chinbutai departed Edo again and later set up a temporary headquarters at the Kaneko family estate, northeast of Edo. They later moved to a new headquarters in Nagareyama in April 25, 1868. During the training at Nagareyama in April 26, 1868, the Kōyō Chinbutai were caught by surprise by the 200 strong Imperial forces led by Vice-chief of Staff Arima Tota of Satsuma Domain and Kondō was ordered to go with them to their camp at Koshigaya. He was later brought to Itabashi in April 27, 1868 for questioning. On the same day Hijikata went to Edo to see Katsu Kaishū and asked for his help in getting a pardon for Kondō. On the following day, a messenger arrived at Itabashi with a letter seemingly written by Katsu requesting that Kondō's life to be spared, but the messenger was arrested and the request was denied. Following his trial in April 31, 1868, Kondō was executed at Itabashi execution grounds in May 17, 1868. Hijikata, convalesced from a foot injury sustained at the Battle of Utsunomiya Castle, brought Kondō's hair to Aizu and was said to have personally supervised the erection of Kondō's grave memorial at Tenneiji Temple. Following the Battle of Bonari Pass, the next day in 7 October 1868, Hijikata met Saitō Hajime at the Inawashiro Castle and stayed at the Saitoya inn in Wakamatsu. When Hijikata decided to retreat from Aizu, Saitō and a small group of Shinsengumi parted with Hijikata and continued to battle in the Battle of Aizu until the very end. Hijikata and his rest of the Shinsengumi went to Sendai, where he joined up with Enomoto Takeaki's fleet. I am not going to battle to win. With the Tokugawa government about to collapse, it would be a disgrace if no one is willing to go down with it. That is why I must go. I will fight the best battle of my life to die for the country. In October 1868, Hijikata and Ōtori Keisuke led Shogunate forces to occupy the fortress of Goryōkaku in the Battle of Hakodate, and continued to eliminate local resistance. When the short-lived Ezo Republic was founded in December, Hijikata was made a vice-minister of the Army. Imperial troops continued to attack by land and sea. In May 6, 1869, Hijikata led a daring but doomed raid to steal the imperial warship Kōtetsu in the Battle of Miyako Bay, in the early morning, a number of oppositionists managed to board the ship via the Kaiten warship, but Kōtetsu repelled the attack and mowed them down with a Gatling gun. Many others including the captain of Kaiten were also killed by gunfire from the Imperial ships. The battle lasted only thirty minutes; Hijikata, the survivors and the Kaiten retreated to Hakodate. Later on the fourth week of May 1869, Hijikata led the 230-strong Republic of Ezo forces and the surviving Shinsengumi against 600 strong Imperial forces during the Battle of Futamata for sixteen hours and were forced to retreat. The Imperial forces attacked again on the next day, only to retreat. On the following night, Hijikata led a successful raid on the Imperial forces' camp, forcing them to flee. Hijikata and the forces later retreated to Hakodate in June 10. Though my body may decay on the island of Ezo, my spirit guards my lord in the East. 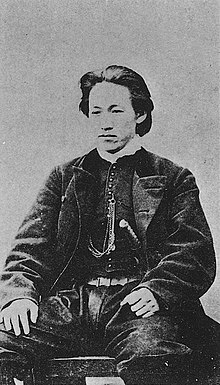 In the final conflict of the revolution, on June 20 (lunar calendar May 11), 1869, Hijikata was killed near the Ippongi Kanmon (一本木関門) while leading his troops on horseback by a bullet that shattered his lower back. His body was later claimed by Koshiba Chōnosuke and others. Three days later in June 23 (lunar calendar May 14), 1869, a remaining group of surviving Shinsengumi members under the last commander Sōma Kazue had surrendered at Benten Daiba. A week after his death, the Goryōkaku fortress was taken, and the military of Ezo Republic surrendered to the Meiji government on June 27, 1869, marked the end of Boshin War. It is unknown where Hijikata was buried, but it is believed that his body was buried either at Goryōkaku, Hekketsuhi or Ganjoji. The first grave memorial of Hijikata was at Wakamatsu-chō, Hakodate, where he was killed, near the reconstructed Ippongi Kanmon in the present day compound of the Hakodate Welfare Centre. A grave memorial of Hijikata was also erected at Sekidenji temple in Hino, Tokyo, Japan. A monument known as Hekketsuhi , was erected at Hakodate in memory of about 800 people, including Hijikata, who died during the Boshin War. In 1875, Nagakura Shinpachi, with the help of Matsumoto Ryōjun and several of his surviving former Shinsengumi comrades including Saitō Hajime among others, erected the monument known as the Grave of Shinsengumi for Kondō Isami, Hijikata Toshizō, and the fallen comrades of the Shinsengumi at Jutoku-ji temple boundary in Itabashi, near Itabashi Station in Tokyo. The Hijikata Toshizō Museum was later established in 1994 near the Sekidenji temple. The Shinsengumi have become a popular subject for films, television, and manga and anime, ranging from historical drama to comedy and romance. As a leader of the group, Hijikata is usually a prominent character in such productions. The novel Moeyo Ken, written by Ryōtarō Shiba, is a dramatization of Hijikata's life. The novel was adapted into a film in 1966 and a television series in 1970 where Hijikata was played by Asahi Kurizuka. Hijikata is depicted in the 1999 film Gohatto ("Taboo") (played by Takeshi Kitano) and the 2013 NHK Taiga drama Yae no Sakura (played by Jun Murakami). He was also played by Koji Yamamoto in both the 2004 NHK Taiga drama series Shinsengumi! (including the single-episode sequel Shinsengumi! : Hijikata Toshizo Saigo no Ichinichi) and 2015 Taiga drama series Asa ga Kita. He is the protagonist in Morita Kenji's manga Getsumei Seiki, and in Mibu Robin's Baragaki ("Red Demon"). He is also featured in a number of other anime and manga series, including Gintama (an inspired character named Hijikata Tōshirō 土方 十四郎), Peacemaker Kurogane, Intrigue in the Bakumatsu - Irohanihoheto, Ghost Slayers Ayashi (as a child, with a brief glimpse of his future death); Kaze Hikaru, Shura no Toki, Hell Girl, Soar High! Isami (inspired character: Toshi Tsukikage) and the popular otome game/anime series Hakuouki: Shinsengumi Kitan. Hijikata is also a supporting character in Shin Teito Monogatari, the prequel to the bestselling historical fantasy novel Teito Monogatari (Hiroshi Aramata). In the manga and anime, Drifters, Hijikata serves as one of the antagonists, who holds hatred to the protagonist, Shimazu Toyohisa, because he is an ancestor of the Shimazu clan he fought. He is also a main character in Golden Kamuy manga drawing a lot of similarities both historically and in overall personality. Hijikata also appears in the mobile game Fate/Grand Order as a limited 5-Star Berserker-class Servant. He debuted during the GUDAGUDA 2: Meiji Restoration event, and his Noble Phantasm is known as Shinsengumi, which gets stronger as his HP dwindles. ^ 幕臣取り立て 新選組概史 歴史館-動乱の章; accessed 16 June 2015. ^ a b c 土方歳三 HIJIKATA, tamahito.com; accessed 16 June 2015. ^ Lee, Rosa (January 2011). "Romanticising Shinsengumi in Contemporary Japan". New Voices in Japanese Studies. Volume 4: 168–187. Hijikata Toshizō and Okita Sōji. Hijikata Toshizō, Okita Sōji zenshokanshū edited by Kikuchi Akira. Tōkyō : Shin Jinbutsu Ōraisha, 1995. ISBN 4-404-02306-5. Miyoshi Tōru. Senshi no fu: Hijikata Toshizō no sei to shi. Tōkyō: Shueisha, 1993. ISBN 4-08-748001-1 ISBN 408748002X. Tanaka Mariko and Matsumoto Naoko. Hijikata Toshizō Boshin senki. Tōkyō : Shin Jinbutsu Ōraisha, 1976. Hillsborough, Romulus. Shinsengumi: The Shōgun's Last Samurai Corps. North Clarendon, Vermont: Tuttle Publishing, 2005. ISBN 0-8048-3627-2.